Kaplan-Meier estimates and net chance of a longer survival by at least m months for proportional hazards (A), early survival difference (B), delayed survival difference (C), curable disease (D), and crossing hazards (E). Δ(m) Indicates net chance of a longer survival by at least m months. Δ(m) = P[T > C + m] – P[C > T + m], where P[T > C + m] is the probability that a random patient in the treatment group survives by at least m months longer than a random patient receiving the control intervention, while P[C > T + m] is the probability that a random patient in the control group survives by at least m months longer than a random patient in the treatment group. C indicates control group; P, probability; T, treatment group. Edgington ES,Onghena P. Randomization Tests. 4th ed. New York, NY: Chapman Hall/CRC Press; 2007. Good P. Comparing two populations. In: Good P. Resampling Methods: A Practical Guide to Data Analysis. 3rd ed. New York, NY: Birkhauser; 2006:31-57. Dmitrienko A, Tamhane AC, Bretz F. Multiple Testing Problems in Pharmaceutical Statistics. New York, NY: Chapman and Hall/CRC Press; 2009. Importance Time to events, or survival end points, are common end points in randomized clinical trials. They are usually analyzed under the assumption of proportional hazards, and the treatment effect is reported as a hazard ratio, which is neither an intuitive measure nor a meaningful one if the assumption of proportional hazards is not met. Objective To demonstrate that a different measure of treatment effect, called the net chance of a longer survival, is a meaningful measure of treatment effect in clinical trials whether or not the assumption of proportional hazards is met. Design In this simulation study, the net chance of a longer survival by at least m months, where m months is considered clinically worthwhile and relevant to the patient, was calculated as the probability that a random patient in the treatment group has a longer survival by at least m months than does a random patient in the control group minus the probability of the opposite situation. The net chance of a longer survival is equal to zero if treatment does not differ from control and ranges from –100% if all patients in the control group fare better than all patients in the treatment group up to 100% in the opposite situation. We simulated data sets for realistic trials under various scenarios of proportional and nonproportional survival hazards and plotted the Kaplan-Meier survival curves as well as the net chance of a longer survival as a function of m. Data analysis was performed from August 14 to 18, 2015. Main Outcomes and Measures The net chance of a longer survival calculated for values of m ranging from 0 to 40 months. Results When hazards are proportional, the net chance of a longer survival approaches zero as m increases. The net chance of a longer survival (Δ) was 13% (95% CI, 6.5%-19.4%; P < .001) when any survival difference was considered clinically relevant (m = 0 months). When survival differences larger than 20 months were considered relevant (m = 20), the net chance of a longer survival was very close to zero (Δ = 0.5%; 95% CI, –0.1% to 1.1%; P = .09). In contrast, when treatment effects are delayed or when some patients are cured by treatment, the net chance of a longer survival benefit remains high and tends to the cure rate. For crossing hazards, the Δ was negative (Δ = –6.9%; 95% CI, –14.0% to –0.5%; P = .047). However when large survival differences were considered (m = 20), the Δ(m) was positive (Δ = 8.9%; 95% CI, 6.7%-11.1%; P < .001). Conclusions and Relevance The net chance of a longer survival is useful whether or not the assumption of proportional hazards is met in the analysis of survival end points and may be helpful as a measure of treatment benefit that has direct relevance to patients and health care professionals. We describe a new measure of treatment effect that directly addresses a question patients might raise, that is, “What is my net chance of surviving longer with treatment than without?” or, by extension, “What is my net chance of surviving at least 6 months longer with treatment than without?” We call this measure the net chance of a longer survival. We investigate the net chance of a longer survival through simulated data sets for a randomized clinical trial under typical scenarios for the treatment effect, and we show that this measure is meaningful and intuitively appealing whether or not hazards are proportional. Question Can net chance of survival be used to interpret treatment benefit and survival differences in clinical trials when hazards are not proportional? Findings The net chance of a longer survival by at least m months, is the probability that a random patient in the experimental arm has a survival longer by at least m months than a random control patient, minus the probability of the opposite situation. When proportional hazards hold, the net chance of a longer survival goes to zero as m increases, while it tends to the cure rate when some patients are cured by treatment. Meaning This method is useful whether or not the assumption of proportional hazards is met in the analysis of survival end points. For each scenario, a data set was generated including 2 treatment groups, each with 600 patients. The simulation parameters are summarized in eAppendix 2 in the Supplement. For each data set, the net chance of a longer survival was calculated and plotted for values of m ranging from 0 to 40 months. Generalized pairwise comparisons were performed with the package BuyseTest in R statistical software (R Foundation for Statistical Computing), available from the corresponding author upon request. Data analysis was performed from August 14 to 18, 2015. No institutional review board approval was required as no actual patient data were analyzed. The Figure shows the 5 simulated scenarios. In scenario 1 (proportional hazards), the survival curves separated harmoniously. Median survival was 9.3 months in the control group and 10.6 months in the treatment group. The net chance of a longer survival (Δ) was 13% (95% CI, 6.5%-19.4%; P < .001) when any survival difference was considered clinically relevant (m = 0 months), which means that a random patient in the treatment group would have a 13% higher chance of a longer survival compared with a random patient in the control group. However, the net chance of a longer survival decreased when long-term survival differences were evaluated. When survival differences larger than 20 months were considered relevant (m = 20), the net chance of a longer survival was very close to zero (Δ = 0.5%; 95% CI, –0.1% to 1.1%; P = .09). In scenario 2 (early survival differences), the net chance of a longer survival was 23% (95% CI, 16.8%-28.9%; P < .001) when any survival benefit was considered clinically relevant (m = 0 months), but it decreased even more quickly than in scenario 1 and was close to zero (Δ = 0.6%; 95% CI, −0.1% to 1.0%; P = .06) when survival differences larger than 20 months were considered relevant (m = 20). In scenario 3 (delayed survival differences), the Δ(m) remained about constant when m was less than 20 months and decreased slowly thereafter. In scenario 4 (curable disease), the Δ(m) remained stable at 10% (95% CI, 7.5%-12.5%; P < .001) regardless of m, which is exactly as expected given the assumption of a 10% cure rate. In scenario 5 (crossing hazards), the survival curves crossed near the eleventh month of follow-up. When any survival difference was considered relevant, the Δ was negative (Δ = –6.9%; 95% CI, –14.0% to –0.5%; P = .047). However when large survival differences were considered (m = 20), the Δ(m) was positive (Δ = 8.9%; 95% CI, 6.7%-11.1%; P < .001). In this study, we attempt to address the question of treatment benefit from the point of view of a patient asking, “What is my chance of surviving longer with treatment than without?” We call this measure of treatment effect the net chance of a longer survival. The Δ(m) has a probabilistic interpretation: it is the difference between the probability that a random patient in the treatment group has a survival longer by at least m months than a random patient in the control group and the probability of the opposite situation, with m being a specified minimal, clinically relevant difference in survival, such as 6 months. An intuitively appealing assessment of the treatment effect may be derived from the Figure representing the Δ(m) as a function of the minimal clinically relevant difference m. For any value of m, the Figure provides the probabilities that the new treatment prolongs or shortens the survival time for a patient by at least m months and the difference between these probabilities. The graphs of the Δ(m) as a function of m show strikingly different patterns in the 5 scenarios considered and, as such, can be useful to describe potential survival benefits in situations of nonproportional hazards. For instance, if there is a cure rate, the Δ(m) trends, as it should, to the proportion of patients who experience a long-term benefit of the treatment (or, in the best-case scenario, to the cure rate). Of the 5 scenarios investigated in this study, the most intriguing was that of crossing hazards. 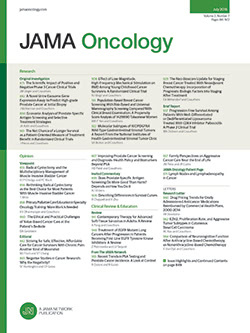 The corresponding data set was simulated to closely resemble the reported progression-free survival (PFS) curves of the Iressa Pan-Asia Study.17 In that study, previously untreated patients with advanced lung adenocarcinoma were randomized to receive either gefitinib (a tyrosine kinase inhibitor of the epidermal growth factor receptor [EGFR]) or a chemotherapy combination of carboplatin and paclitaxel. Activating EGFR mutations are now known to be predictive of benefit from gefitinib.30 Although this predictive role was unknown when the Iressa Pan-Asia Study17 was initiated, the frequency of such mutations was high (approximately half of all patients) because the study was carried out among Asians and a large proportion were nonsmokers or light smokers, 2 characteristics associated with activating EGFR mutations. In the corresponding simulated data set, the PFS Kaplan-Meier curves crossed, and the assumption of proportional hazards was obviously violated; hence, the overall HR of 0.75 reported in the trial was not meaningful as well as potentially misleading. The analysis of the net chance of a longer PFS identified a clear benefit in favor of the treatment (gefitinib) when long-term PFS differences were considered (m > 20 months). However, the control group had a better outcome when any PFS difference was considered relevant (m = 0). The mutation data provide a clear explanation for this pattern: patients who did not have an EGFR mutation had a poorer outcome when they received gefitinib because this targeted agent had no antitumor effect in them; hence, these patients did worse than patients receiving chemotherapy. In contrast, patients who had an EGFR mutation had a better outcome when they received gefitinib and experienced much longer PFS times. Now that the predictive value of EGFR mutations is established, clinical trials would no longer include all patients, or an analysis stratified by EGFR mutation would be performed. The net chance of a longer survival may be particularly helpful as a measure of treatment effect when hazards are not proportional. Such nonproportional hazards may result from the following 2 main mechanisms: interactions between the treatment effect and features of the patient or disease (eg, EGFR mutations in the Iressa Pan-Asia Study17), and variation of the treatment effect over time (eg, in trials comparing transplantation with nontransplantation strategies). In such cases, Kaplan-Meier curves often display unusual shapes, and standard comparison techniques may lead to erroneous conclusions.23,31 Even in these cases, the net chance of a longer survival provides a heuristic interpretation of the treatment effects on the time scale, which is the scale most relevant to patients and health care professionals. Accepted for Publication: December 16, 2015. Corresponding Author: Marc Buyse, ScD, International Drug Development Institute, 185 Alewife Brook Pkwy, Ste 410, Cambridge, MA 02138 (marc.buyse@iddi.com). Published Online: April 28, 2016. doi:10.1001/jamaoncol.2015.6359. Author Contributions: Dr Péron had full access to all the data in the study and takes responsibility for the integrity of the data and the accuracy of the data analysis. Study concept and design: Péron, Roy, Roche, Buyse. Drafting of the manuscript: Péron, Buyse. Critical revision of the manuscript for important intellectual content: Roy, Ozenne, Roche, Buyse. Administrative, technical, or material support: Roy. Funding/Support: This study was supported by a grant from the Nuovo-Soldati research foundation (Dr Péron).